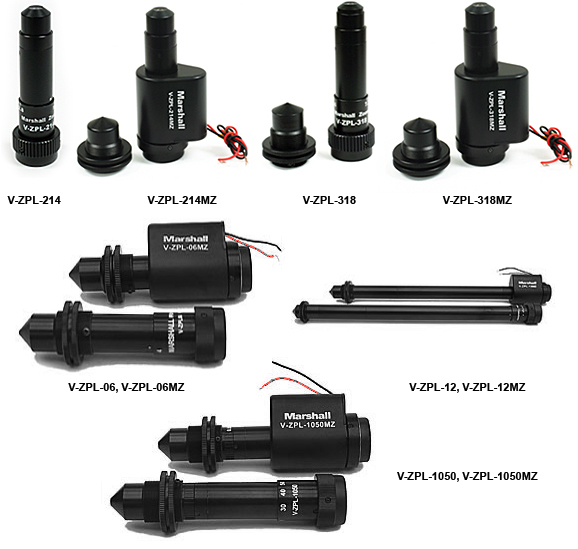 Marshall Electronics Optical Division - Zoom Pinhole and High Tech Zoom Pinhole Lenses are perfect for security, robotics, OEM applications, automobile, industrial video, covert security, and surveillance industry. These lenses are ideal for those tough situations where the camera must be hidden and provide any angle of view between 4-20mm or 10-50mm. Although designed for the new 1/3" electronic iris cameras, these lenses can also be used on ½" cameras where they can provide up to a 120 degree horizontal field of view at 4mm. The tip of the pinhole is built-in to a removable push-on cap that also acts as a mounting support and protects the main optical system from damage. The motorized MZ series operate with 7-12VDC to power their zoom motors. Recommended voltage is 9VDC.